When Sixteen92 announced the Circle subscription, I and I think everyone else was pretty hesitant. After all, it was $85 upfront for the entire year subscription, with shipments coming quarterly. But it's different from many other indie subscriptions, in that the products are only from Sixteen92, there are no guest products. And it's only a preview of the seasonal scents for each quarter, with one exclusive perfume. So if you missed out on this sub, you really only missed that one exclusive scent; everything else will be made available at a later time. I guess asking for $85 up front is better than trying to deal with notoriously awful subscription software, that tends to break for no known reason, but I had to soften the blow by splitting the sub with a friend. 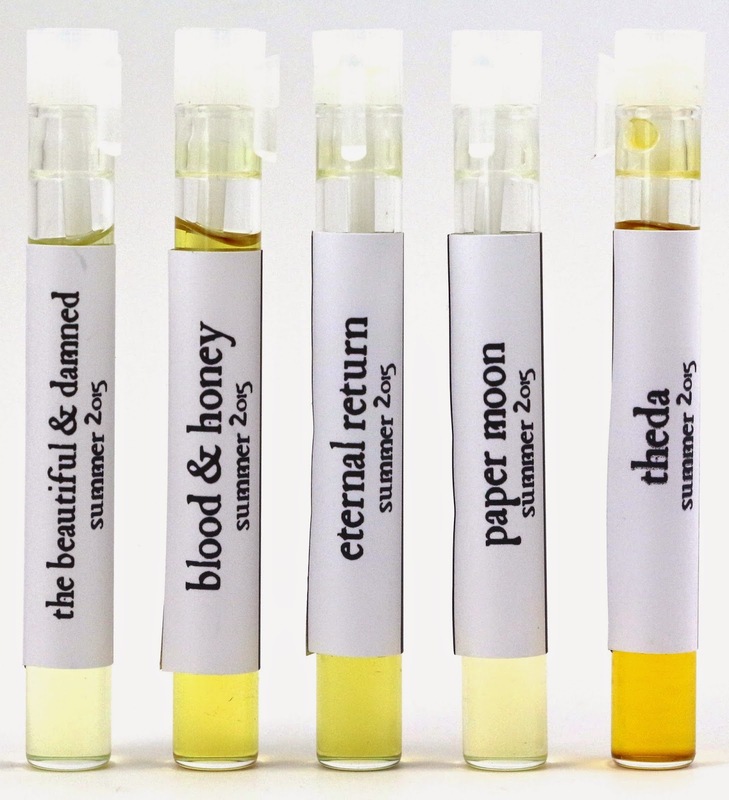 About - Sixteen92 is a newer indie company, owned by Claire and based in Texas, that specializes in perfume. They also recently introduced their bath and body product line, including shower gel and hand & body lotion. Shipping - The Summer edition shipped the first week of May, and arrived in 4 days via USPS from Texas to California. Product Size - All perfumes in this subscription will be sample 2 ml vials, except the exclusive full size which is 5.5 ml. Free Samples - I received one free perfume sample with this first installment. I don't know if this will be a trend, but it was definitely appreciated. 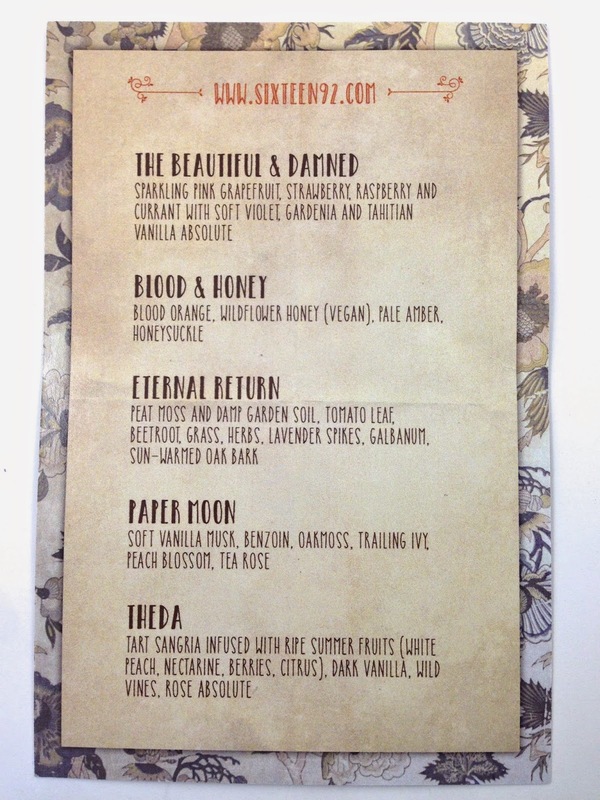 Here's the beautiful info card with the scent names and descriptions. The Beautiful & Damned - "Sparkling pink grapefruit, strawberry, raspberry and currant with soft violet, gardenia Tahitian vanilla absolute." Heavy on the fruits and florals, this is a sweet scent with a tanginess from the grapefruit. It's light and playful, but not for the fruit or floral wary. I don't have many perfumes with violet notes that really stick out, but this one does, and it's a great addition with the juicy fruit notes. I love strawberries, but I have yet to come across a perfume with a strawberry note that I really enjoyed. This is it. Very lovely, sweet yet tart. It reminds me of body wash kind of, I feel like I've smelled a similar scent. After a while, my skin tends to do funny things to overly fruity perfumes, amps certain notes or something, but this would probably be one I would have to pass on. I feel like it could give me a headache if the conditions were right. Blood & Honey - "Blood orange, wildflower honey, pale amber, honeysuckle." I immediately get the blood orange and honey. The honey note in this scent is a vegan version, but it smells really accurate. After a minute or so, the honeysuckle comes through a bit more, and the amber blends it all together. The honey does start to take over a bit, and dominate the blend, but it smells slightly sweet and florally. I'm not sure how I feel about this one. I think I like it. If you enjoy honey scents, this will definitely be for you. And even though something like longevity of a perfume is going to vary person to person, I want to note I was very impressed that I was still getting whiffs of this when I went to bed. It lasted quite a long time compared to other Sixteen92 scents, and other long lasting perfumes I own. Eternal Return - "Peat moss and damp garden soil, tomato leaf, beetroot grass, herbs, lavender spikes, galbanum, sun-warmed oak bark." Umm hello, this is like summer gardening in a bottle. It smells like you're planting tomatoes out in the backyard on a warm summer day. I absolutely love the smell of tomato leaves, so this perfume is right up my alley. It's very fresh and green, with a bit of dirt mixed in. I would love this as a soap, I hope shower gels come back soon, those would be perfect for this scent. If you like tomato leaf scents, this will be perfect for you, and the soil notes aren't too prominent either for those who don't enjoy that. Paper Moon - "Soft vanilla musk, benzoin, oaks, trailing ivy, peach blossom, tea rose." Yum, this reminds me a bit of the exclusive Hello Waffle Visage scent that Sixteen92 did called Talia. It's got a similar soft vanilla mixed with green and woodsy notes. It's very light, but just beautiful, I love the addition of the other notes that make it smell different from Talia. I don't find this has much silage though, but would absolutely be something I'd consider a full size of. There's just something about a vanilla based perfume that I love for all occasions. If you missed out on Talia and wished you had got one, this smells really similar. Theda - "Tart sangria infused with ripe summer fruits (white peach, nectarine, berries, citrus), dark vanilla, wild vines, rose absolute." Immediately, this scent is all peaches, all the way. If you've been looking for a great juicy peach and nectarine perfume, this is a beautiful one to go with. After a bit, some of the other notes come through a bit, including the rose, which is a great combination with the peach. But I wouldn't call this a sangria perfume or tart, it's sweet and smells more like stone fruits than anything else. I think this would be phenomenal mixed with a bit of The Beautiful & Damned, that would be a great scent to layer together on your skin. Overall, I absolutely love the Sixteen92 summer collection, and I think it's the first time I'm considering getting full sizes of some. Not just one, but possibly multiple scents. My favorites, and ones I'm considering full sizes of are, Blood & Honey, Eternal Return, and Paper Moon. And I could probably be easily talked into a full size of Theda as well. Which is awesome! I find that the more I test perfumes, the more I tend to like and enjoy, but not always enough to find myself wanting a full size bottle. I just love this collection, and I was so happy to find that many of them were much longer lasting than I've experienced in the past. I think the new carrier oil blend is definitely helping with that, at least for me. I haven't tried too many yet, but at least so far this collection is definitely my favorite summer collection. I'm going to do a little cost breakdown of this subscription, considering you could buy almost everything included at a later time. You do save money by subscribing instead of buying it all separately, but I want to know exactly how much. Availability - These will be made available starting May 29th at 9 AM CST, along with some new summer lotion scents as well. Overall Satisfaction - My favorites are Blood & Honey, Eternal Return, Paper Moon, and Theda. These were much longer lasting than other Sixteen92 perfumes with the old carrier oil formula. Definitely worth a try if you enjoy fruit, sweet, floral, or green scents, these will be right up your alley. 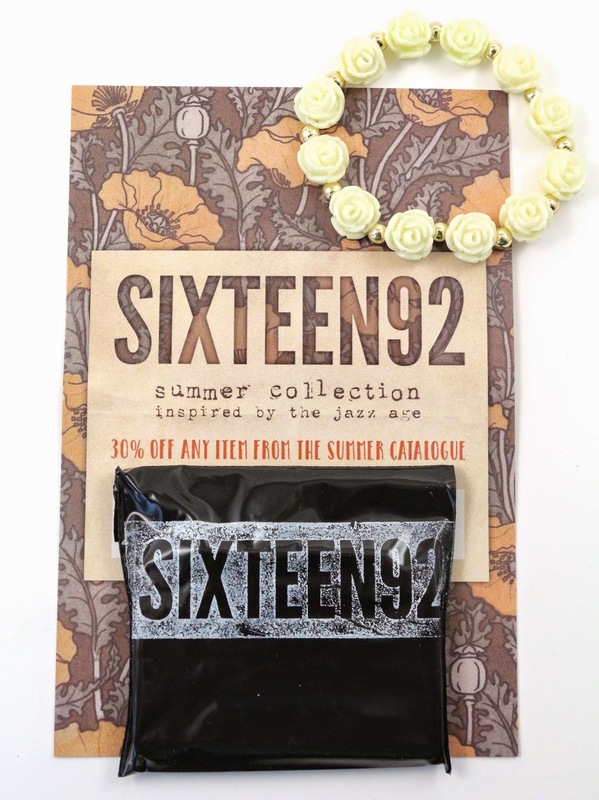 What did you think of the Sixteen92 Summer 2015 Circle? Let me know in the comments!